Does The Last Jedi Trailer Show More of Rey's Flashback? After making fans wait for a very long time, Disney and Lucasfilm finally released the first teaser trailer for Star Wars: The Last Jedi this past week. The trailer has been viewed repeatedly by millions of Star Wars fans all around the world since it debuted at Star Wars Celebration, but there are still secrets being uncovered as the trailer continues to be combed through frame by frame. One discovery that has been made that wasn't noticed initially is that it seems like we will be seeing at least some more of Rey's flashback from Star Wars: The Force Awakens in The Last Jedi. During Rey's Force flashback at Maz Kanata's palace in Star Wars: The Force Awakens, we see a shot of a cloaked Luke Skywalker putting his hand on R2-D2. This moment was initially revealed in the first, brief teaser that was released for the movie. In the new trailer for Star Wars: The Last Jedi, which was uploaded to the Star Wars YouTube channel right as it debuted during the panel at Celebration, we see a shot of Luke and R2-D2 looking toward a flaming structure. For reference, this moment occurs at the 1:30 mark, in case you need a refresher. When comparing this shot to the shot of Luke from Rey's flashback, it looks as though these are both part of the same sequence. There was almost no context provided for anything we see in the teaser for Star Wars: The Last Jedi, but when looking at both shots, there is enough circumstantial evidence to conclude that the moments are both part of the same, longer scene. The colors of both scenes are seemingly identical and Luke appears to be wearing the same cloak. 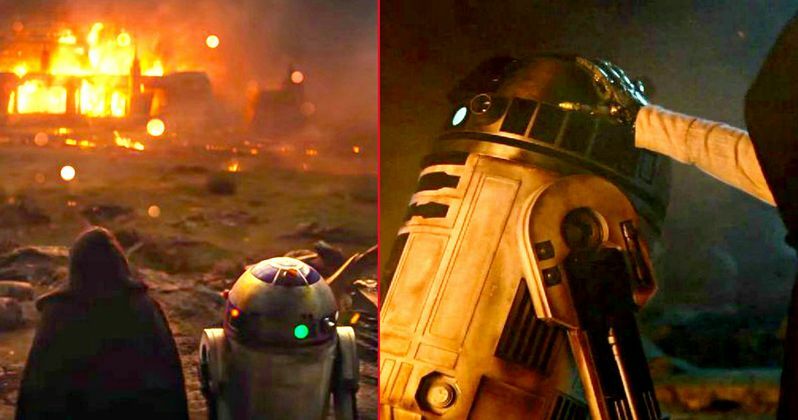 Also, in the scene from The Force Awakens when Luke puts his hand on R2, there are clearly flames in the scene. It would appear that this could just be a different angle of the two looking at that unidentified burning building in the distance. That means we may be seeing the entire scene in which Kylo and The Knights of Ren murder Luke's new generation of Jedi, which was talked about in Star Wars: The Force Awakens and alluded to in Rey's flashback. Some may point to the shot of Captain Phasma walking through flaming wreckage that immediately follows the shot of luke in the Star Wars: The Last Jedi trailer, saying that her presence there would mean that this sequence isn't the same as Rey's flashback. However, the floor in the Captain Phasma shot appears to be shiny, which means that it may not be from the Luke sequence, even though it comes right after the shot in question sequentially. It is possible the Captain Phasma bit takes place at the Rebel base where we see Poe's X-Wing destroyed. Since the trailer is mostly just a bunch of quick cuts of seemingly random shots, there is nothing that says the Captain Phasma and Luke shots are linked, even though they take place one after another. Luke is clearly a bit disenchanted and having a tough go of it in Star Wars: The Last Jedi, so seeing the entire scene in which The Knights of Ren take out his Jedi trainees would provide some great context for that. We'll have to wait and see if this is actually what director Rian Johnson has in store for us, but there is certainly enough evidence to support it at this point. Star Wars: The Last Jedi is set for release on December 15. You can check out a side-by-side comparison of the shots for yourself below, along with Captain Phasma's entrance against that mirrored floor, and the X-Wing explosion, which also has a reflective floor and similar light structures in the shot.